Two houses in the old part of Salobreña, in a superb setting, at the foot of the Castle. The area has been declared a place of Andalusian Historical Heritage. Magnificent views of the sea, Sierra Nevada and the Castle. A house sleeping six people: three double rooms, three bathrooms, a fully equipped kitchen, lounge-dining room, two terraces with garden furniture and a solarium. A house sleeping two people: a double room, bathroom, a lounge with a sofa bed, a fully equipped kitchen, two terraces with garden furniture and a solarium.The house can be rented as a whole unit or per room. We expend three wonderful days at the end of october at Faldas del Castillo, all was perfect!!! But I'd like to emphasize the kindness of the owner Anuncia and the views from the house. We enjoyed our stay at Faldas del Castillo a lot. 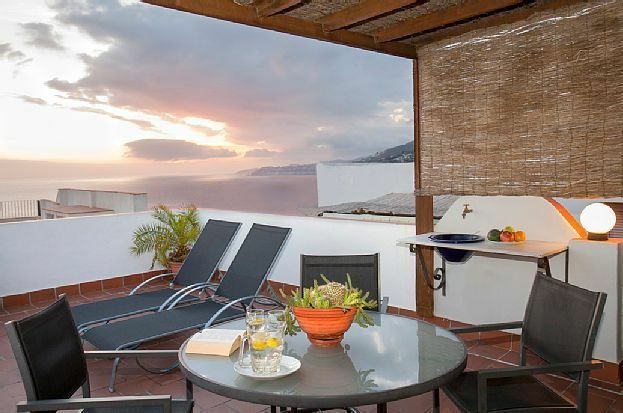 Very nice accomodation, very beautiful landscape and overlooking from the terraces! We stayed at the "Buganvilla" apartment with three bed rooms and two balconies divided on three floors. The premises were excellent and we really enjoyed our 1½ week in Salobrena. Salobrena is a nice, quiet and local town with all you need, although if you want a lot of foreign tourists (non-Spaniards) you will be disappointed. The kids (4+6 yrs) loved the apartment and felt quickly at home. We can recommend it to others.